Over the last month and a half, a decade-long project to move the village of Newtok, in the Yukon Delta, is finally beginning to take shape. 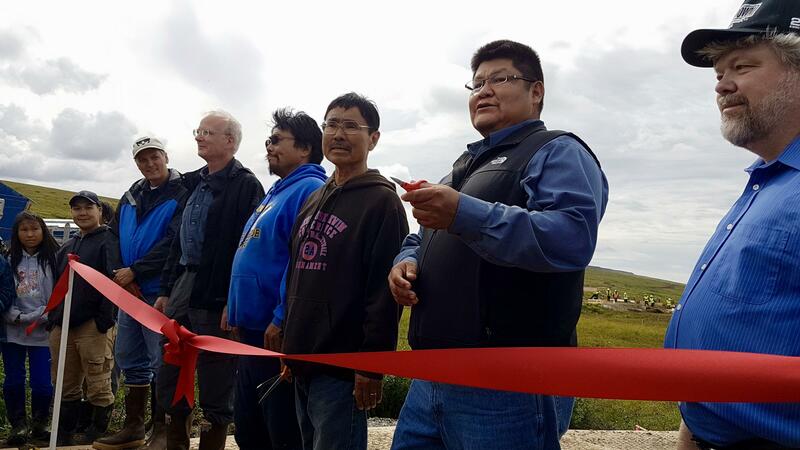 Last Thursday a ribbon cutting was held in Mertarvik, which means “a place for water”. The new community is safely above the rising water, which threatens village of Newtok. A small group of Newtok residents gathered high up on the bluffs at the new site of, the village in Mertarvik. Lifelong Newtok resident Albertina Charles, is thrilled to be here. Located a 10 to 15 minute walk from the newly extended boat harbor, five to six homes – three of which currently occupied – a steam house and foundational pilings for four new homes line the main avenue. Construction here has focused on water infrastructure. Recent additions to life in Mertarvik include; on-site hot and cold running water, along with two drilled wells and water tanks; a bathroom with four showers and four toilets; three washers and three dryers and a boiler; and a hundred and twenty five kilowatt generator – equivalent to the power that is currently in Newtok. Still under construction is the Mertarvik Evacuation Center, which the community hopes to start using next year. The two-room building is being built large enough to house two hundred and fifty people, if need be. A little ways further up the hillside is the dining hall that Troy Welch from HC Contractors helped build. Planners are still working to secure the rest of the funding for the building, and much of the planned housing. Though there is much more to be done, there has been progress. It’s been six years since Larry Hartig, the Commissioner of the state Department of Environmental Conservation, was here. He has been working on relocating Newtok for a decade. “It was really great to see the rock pit open and see the progress on the road, because I can remember when we just wished we had a rock pit. [laughs] There has been good progress,” Hartig said. Hartig said the Commission’s ability to connect state and federal agencies has been crucial. He also pointed out that the two wells that have been drilled will be able to use gravity to deliver the water, and that will save on operating costs. The biggest uncertainty threatening continued progress at Metarvik is what kind of federal funding will be available. In a boat headed back to the old village site, Lynn Polacca, the Bureau of Indian Affairs Acting Regional Director said Newtok is only one of many villages at risk from climate change. He said the BIA is able to help fund roads but does not have as much money available for housing. “Anything tied to transportation, that’s what we fund for BIA, and we’ve got limited funding for housing but you know, we try to help out where we can,” Polacca said. Newtok resident Albertina Charles is ready to be among the first to move to Metarvik. With grey skies coming in, Albertina Charles was remembering those fall storms.